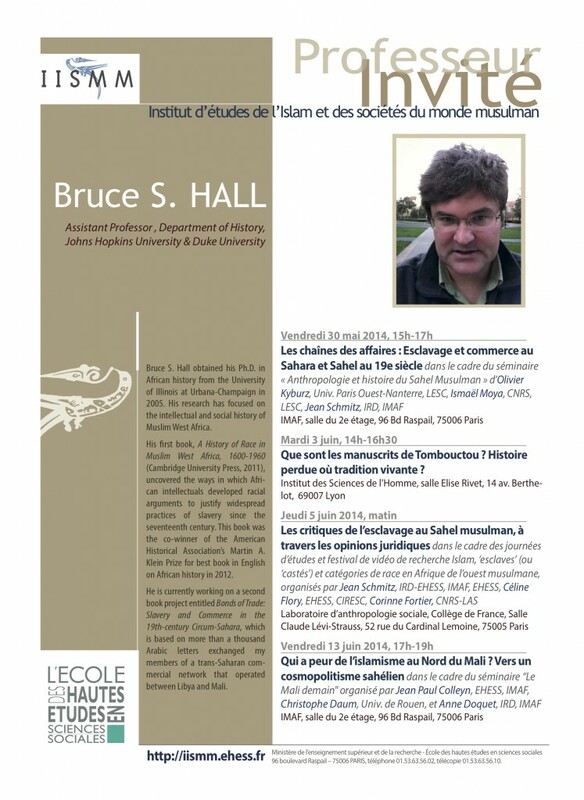 Bruce S. Hall obtained his Ph.D. in African history from the University of Illinois at Urbana-Champaign in 2005. His research has focused on the intellectual and social history of Muslim West Africa. His first book, A History of Race in Muslim West Africa, 1600-1960 (Cambridge University Press, 2011), uncovered the ways in which Afri- can intellectuals developed racial arguments to justify widespread practices of slavery since the seventeenth century. This book was the co-winner of the American Historical Association’s Martin A. Klein Prize for best book in English on African history in 2012. He is currently working on a second book project entitled Bonds of Trade: Slavery and Commerce in the 19th-century Circum-Sahara, which is based on more than a thousand Arabic letters exchanged my members of a trans-Saharan com- mercial network that operated between Libya and Mali. Que sont les manuscrits de Tombouctou? Histoire perdue où tradition vivante ?